When MDHHS’ Mr. Nick Lyons and Dr. Eden Wells were charged with felonies associated with the Flint Water Crisis back in June 2017, we took a wait and see attitude. Our original reading of internal e-mails produced through our Freedom of Information Act (FOIA) requests had led us to blame misconduct by a few employees at the Michigan Department of Environmental Quality (MDEQ) as the primary cause of the Flint water crisis. We contended that the governor’s office and the Michigan Department of Health and Human Services (MDHHS) were certainly guilty of being overly trusting of those engineers and scientists, but that the true criminal acts were the lies told by these few MDEQ employees. While we always remain open to new information, nothing presented to Dr. Edwards in the preliminary hearings has changed our opinion. Anyone following us also knows we are not shy about calling out bad actors. In late September 2015, we wrote that some MDHHS employees were behaving unethically, but within a few days MDHHS reversed course by agreeing the water was unsafe, and after Dr. Wells started working with us in December 2015, we were impressed enough to call her out publicly in a good way on our webpage on January 7, 2016. Ever since, Michigan government has supported our scientific work and professionally answered all our questions, even when they were fully aware our research was showing that the switch to Flint River water was one key factor contributing to the Legionnaires’ Disease outbreak and associated deaths. We published two peer-reviewed journal papers documenting this science in 2016 and 2017. At no point did anyone at MDHHS or the governor’s office discourage or impede our teams ground-breaking research that helped reveal the Flint Legionella outbreak. Given our own positive experiences with MDHHS since December 2015, we were surprised when professors representing the Flint Area Community Health and Environment Partnership (FACHEP) alleged under oath that the State of Michigan had not cooperated with their Legionella research. Indeed, sworn testimony by FACHEP professors was a basis for felony “obstruction of justice” charges against Wells and Lyons. To date, the media has generally sided with the presumably noble FACHEP professors and against the maligned state employees in these disputes. Starting with this article, Flintwaterstudy will present an investigative series that calls that narrative into question, by examining FACHEP’s public leadership, especially as represented by Dr. Shawn McElmurry (Wayne State), Dr. Nancy Love (University of Michigan) and Dr. Laura Sullivan (Kettering University). In Part 1 of this series, we examine the role of Dr. Shawn McElmurry, an Associate Professor at Wayne State, who was essentially given carte blanc leadership of FACHEP in his formal role as Principal Investigator. Indeed. McElmurry burst onto the scene of the Flint Water Crisis in October 2015, by introducing himself to Dr. Edwards of Flintwaterstudy as an extraordinary humanitarian who had just completed 5 years of research into the Flint water distribution system at the direct request of then-Mayor Dayne Walling. 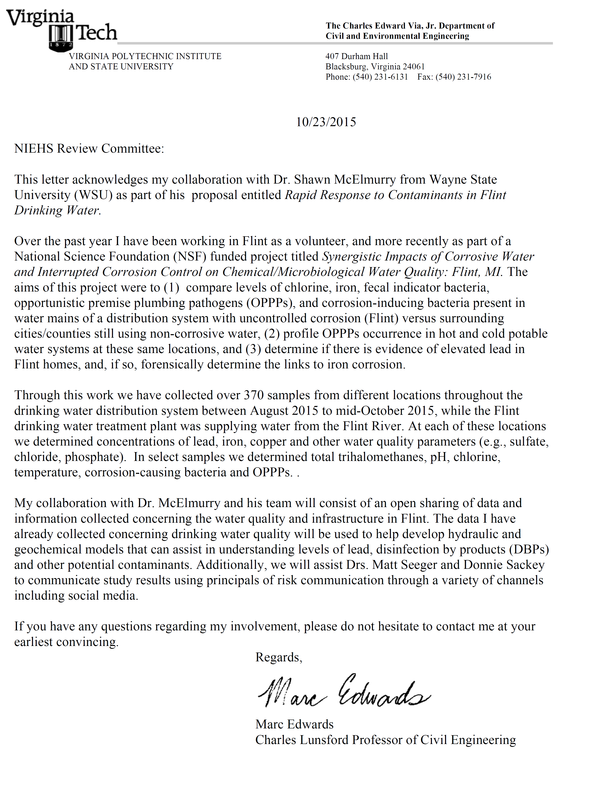 McElmurry also provided Dr. Edwards with his pre-proposal for an emergency research grant to the National Institutes of Health (NIH), which stated that he was “able to respond with this rapid assessment based on our intimate understanding of the Flint regional water system and social infrastructure” and due to his “research focused on how to best adapt Flint’s existing water infrastructure to changes in population and industrial demand… over the last 5 years.” McElmurry further asserted to both NIH and Dr. Edwards that he possessed “a complete hydraulic model of Flint’s water distribution system” as a result of “his” research work. In the unfolding Flint Water Crisis, such a combination of local scientific knowledge, on-the-ground experience, social contacts and a working hydraulic model were urgently needed. McElmurry’s declaration that he possessed such expertise and assets represented a “golden ticket” to disaster relief research funding and a designated seat at situation room tables where important decisions would be made directly affecting the recovery. Edwards promptly introduced McElmurry to the inner circle of those working on the water crisis response and and wrote a letter of support for the $422,000 NIH grant which McElmurry was awarded. Within months, McElmurry’s “unique qualifications” and claims of “intimate understanding” based on his 5-year volunteer humanitarian research mission in Flint, snowballed into his designated sole-source leadership role in the $3.35 million FACHEP grant. He also was involved in winning three emergency grants from the National Science Foundation to study water filters, which Dr. Edwards also helped him to obtain, with his Wayne State colleagues and Dr. Nancy Love at the University of Michigan. By late 2016 and early 2017, Wayne State (and other collaborators) were awarded $12.3 million of other NIH grants which prominently boasted about McElmurry’s pioneering work in Flint. Wayne State University was so proud of how the emergence of FACHEP was playing out in the media and in garnering funding, that they even “branded” their Flint efforts with a heart-warming “Wayne State for Flint” logo. Unfortunately for everyone involved (e.g., unsuspecting Flint residents, accused state employees, prosecutors who have been relying on his expertise and testimony) McElmurry’s claims about his prior work in Flint were too good to be true. At best his experience in Flint was grossly exaggerated, and at worst he perpetrated outright academic identity theft, with profound long-term economic and social consequences for Flint and the State of Michigan. Herein we present just some of the evidence of unethical behavior by FACHEP’s founder, which led us to this regrettable conclusion. By January 2016, McElmurry’s humanitarian story about his years of volunteer work in Flint, seemed demonstrably inconsistent with his behavior and performance as observed by Flintwaterstudy’s Dr. Edwards. McElmurry showed little interest in conducting quality science or actually helping Flint residents, but rather, was myopically focused on seeking funding and associated academic power. Whenever he was directly questioned about specifics related to his supposed “intimate knowledge” of the Flint water distribution system, McElmurry was completely clueless and unable to provide answers to even the most basic questions. In October 2015, McElmurry acknowledged he did not know how to contact Howard Croft, Flint’s Director of Public Works, and asked Edwards to introduce them. 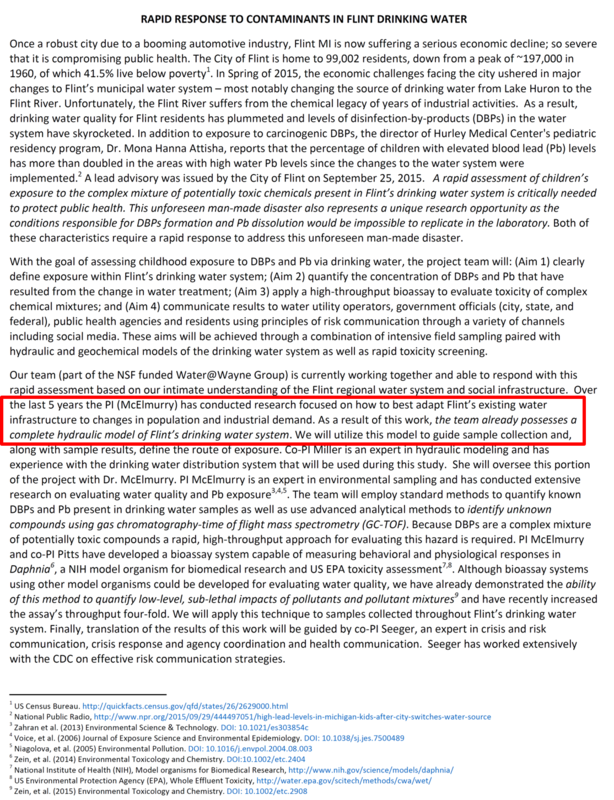 To date, we have not found anyone who can verify that McElmurry was leading the research that he claimed, into the Flint water distribution system from 2010-2015. When asked, former Mayor Walling stated that while he does not specifically remember McElmurry, he did recall research into Flint’s water distribution system that was led by Purdue University. 2. Meet Dr. Kasey Faust: The actual expert that McElmurry was pretending to be. At that point Dr. Marc Edwards reached out to Dr. Kasey Faust, a remarkable young woman from Purdue University who did work in Flint as part of her PhD dissertation (2011-2015). In 2011, Faust won a prestigious National Science Foundation Graduate Research Fellowship, which enabled her to conduct research helping “shrinking cities,” like Flint, understand and prepare for challenges to their water sector infrastructure. After Faust and her PhD advisor met McElmurry at an EPA organized workshop in April 2012, he was invited to be an external member of her PhD advisory committee in January 2013. Notably, the word “Flint” was not mentioned in McElmurry’s VITA or statement of qualifications provided to Purdue University at that time. Moreover, Faust and her advisor are not aware of McElmurry being independently involved in data collection related to Flint’s water distribution system, nor did McElmurry accompany Faust or her advisor on their trips to Flint, in his role as her external PhD committee member. In response to a FOIA from Mr. Lyon’s lawyers, Dr. Faust provided her e-mail correspondences with McElmurry, and they are quite revealing. Reading through the emails is truly heart-breaking: suddenly McElmurry’s “cluelessness” makes perfect sense. McElmurry literally stole Dr. Faust’s unique and visionary work and claimed it as his own in order to get his foot in the door and a leading seat at the table in Flint. How did he do it? First, in October 2015, McElmurry asked Faust to participate in his NIH emergency grant. This would have been a tremendous opportunity for Dr. Faust, who was now a newly minted assistant professor at the University of Texas, and it could have showcased her visionary expertise and continue her quest to help Flint residents. Next, McElmurry requested that Dr. Faust send him her Flint water network and associated hydraulic models from her dissertation work for the NIH proposal. Faust also introduced him by email to people in Flint with whom she had worked. Final step, once Dr. McElmurry had the data/hydraulic models and introductions to collaborators in hand, he subsequently claimed they were “his” and cut Dr. Faust out of his NIH grant. McElmurry then used her data/models into his NIH grant proposal (without her permission or knowledge). At some point he did inform Dr. Faust that he was sorry she was dropped from the NIH proposal, but that the research went in a different direction than anticipated. Thereafter, McElmurry essentially assumed Faust’s identity related to her Flint work and embellished it by adding three years additional effort for good measure. In this manner, McElmurry completed his academic identity theft, effectively lining his own pockets, opening the door to important leadership roles and harnessing the Flint disaster for his self-promotion—at the expense of Dr. Faust, Flint and MI residents. 3) Violating Ethical Canons of Engineering and Perjury? By now, McElmurry has told and re-told the story of his 5-year volunteer humanitarian research mission in Flint so many times, he probably believes it himself. He testified to this story under oath as the star witness in the prosecution case against Mr. Lyons and Dr. Wells, and it is prominently featured in FACHEP press commentary and in Wayne State pressroom materials. McElmurry occasionally cites a research paper written by Dr. Faust, on which he was included as the last (i.e., least contributing) author, to imply intellectual ownership of her entire dissertation work. Here is an example from a Wayne State page: “McElmurry [began] working in Flint in 2010 (Faust et al 2015)“. However, according to Dr. Faust and her advisor, he conducted none of the work in that paper related to Flint or any other specific city mentioned. Wayne State release states Dr. McElmurry began working in Flint in 2010 citing a research paper by Dr. Kasey Faust. According to Dr. Faust and her then-PhD advisor, McElmurry did none of the work on Flint (or other cities) described in that paper. As the veil is now being lifted, it is becoming more and more apparent that Dr. McElmurry seems to be in the habit of making false statements that benefit his career. When posing as a “uniquely qualified” leader for the FACHEP funding in 2015, he asserted in writing to the State of Michigan that his research specialty was in “urban infrastructure and human health.” This false claim was not added to his online VITA until mid-2017, before his sworn testimony in the case against Lyons and Wells. The reality is that McElmurry’s true experience and academic record do not qualify him to serve as a contributing member of a group like FACHEP, much less lead it on behalf of Flint residents and the State of Michigan. Accordingly, Dr. Edwards has submitted a corresponding complaint to the Michigan Department of Licensing and Regulatory Affairs (LARA) and has agreed to testify in a second canon violation hearing if necessary. He has also reported McElmurry to NIH for possible scientific misconduct in the midst of a Federal Emergency, due to falsifications that directly (and indirectly) may have won millions of dollars in research grants for himself, Wayne State University, and his collaborators. When it comes to truly criminal behavior related to the FACHEP grant, perhaps the individuals who are presently accused, should be star witnesses for the State of MI in the case against Dr. McElmurry. The dark details of this case are truly fascinating; an unfolding engineering ethics case study that students should probably take a look at in ensuing years. What I still scratch my head over is this…. after achieving the funding, pubs and success within ones own institution wasn’t that enough?? This narrative points out correctly how the Michigan press has largely sided with the Prosecutor and their FACHEP witnesses (McElmurry etc.) against the unpopular and maligned state personnel. But provided motive to be a Star Witness for Prosecution of two state employees? Was it: 1). vindictiveness for trying to restrict and cut off funding for the FACHEP’s (perhaps poorly designed) ‘research’ program, 2). outrage at comments and treatment by these 2 officials indicating unprofessionalism and disregard for human life as witnesses professed, or, 3). was it a darker desire for even more of the Stage’s spotlight and limelight in the waning hours of this Flint water crisis? Consideration of these motives casts a frightening shadow over the human impulses driving modern scientific efforts. Ugly as they may be it is critical that they come to light for society to be able to effectively police such ‘research’ efforts.